John Hasbrouck Van Vleck (March 13, 1899 – October 27, 1980) was an American physicist and mathematician, co-awarded the 1977 Nobel Prize in Physics, for his contributions to the understanding of the behavior of electrons in magnetic solids. J. H. van Vleck participated in the Manhattan Project. In June 1942, J. Robert Oppenheimer held a summer study for confirming the concept and feasibility of nuclear weapon at the University of California, Berkeley. Eight theoretical scientists, including J. H. van Vleck, attended it. From July to September, the theoretical study group examined and developed the principles of atomic bomb design. J. H. van Vleck's theoretical work led to the establishment of the Los Alamos Nuclear Weapons Laboratory. He also served on the Los Alamos Review committee in 1943. The committee, established by General Leslie Groves, also consisted of W.K. Lewis of MIT, Chairman; E.L. Rose, of Jones & Lamson; E.B. Wilson of Harvard; and Richard C. Tolman, Vice Chairman of NDRC. The committee's important contribution (originating with Rose) was a reduction in the size of the firing gun for the Little Boy atomic bomb, a concept that eliminated additional design-weight and sped up production of the bomb for its eventual release over Hiroshima. However it was not employed for the Fat Man bomb at Nagasaki, which relied on implosion of a plutonium shell to reach critical mass. In 1961/62 he was George Eastman Visiting Professor at University of Oxford and Professorship of Balliol College. In 1950 he became foreign member of the Royal Netherlands Academy of Arts and Sciences. He was awarded the National Medal of Science in 1966 and the Lorentz Medal in 1974. 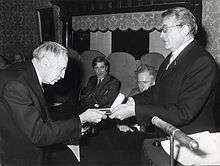 For his contributions to the understanding of the behavior of electrons in magnetic solids, van Vleck was awarded the Nobel Prize in Physics 1977, along with Philip W. Anderson and Sir Nevill Mott. Van Vleck transformations and Van Vleck paramagnetism are also named after him. He awarded the Irving Langmuir Award in 1965, the National Medal of Science in 1966 and elected a Foreign Member of the Royal Society (ForMemRS) in 1967. He was awarded the Elliott Cresson Medal in 1971, the Lorentz Medal in 1974 and the Nobel Prize in Physics in 1977. J. H. Van Vleck and his wife Abigail (1899-1989) were also important art collectors, particularly in the medium of Japanese woodblock prints (principally Ukiyo-e), known as Van Vleck Collection. It was inherited from his father Edward Burr Van Vleck. They donated it to the Chazen Museum of Art in Madison, Wisconsin in 1980s. 1 2 Bleaney, B. 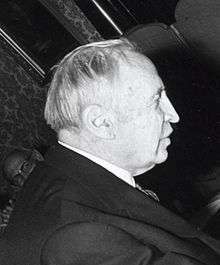 (1982). "John Hasbrouck Van Vleck. 13 March 1899-27 October 1980". Biographical Memoirs of Fellows of the Royal Society. 28: 627–626. doi:10.1098/rsbm.1982.0024. JSTOR 769913. ↑ Van Vleck, J.; Weisskopf, V. (1945). "On the Shape of Collision-Broadened Lines" (PDF). Reviews of Modern Physics. 17 (2–3): 227. Bibcode:1945RvMP...17..227V. doi:10.1103/RevModPhys.17.227. ↑ "John Hasbrouck van Vleck (1899 - 1980)". Royal Netherlands Academy of Arts and Sciences. Retrieved 17 July 2015. ↑ "The Lorents medal". Lorentz.leidenuniv.nl. Retrieved 2012-07-27. 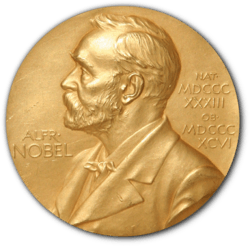 ↑ "The Nobel Prize in Physics 1977". Nobelprize.org. Retrieved 2012-07-27. ↑ "John Van Vleck, Nobel Laureate Known for Work on Magnetism; Earned Three Degree". The New York Times. October 28, 1980. p. A32. Wikimedia Commons has media related to John Hasbrouck Van Vleck. Duncan, Anthony and Janssen, Michel. "On the verge of Undeutung in Minnesota: Van Vleck and the correspondence principle. Part one," Archive for History of Exact Sciences 2007, 61:6, pages 553–624.